Brief Background: I started backpacking and hiking seriously almost four years ago. Most of my miles have been logged in New Hampshire and Massachusetts. I have recently finished 1200+ miles (2000+ km) of the Appalachian Trail. My style is to be as light as possible while not spending a fortune. My pack weight tends to hover around 25 lbs (11 kg) with two days of food and 16 oz (0.5 L) of water. I have recently started getting into winter hiking, snowshoeing and kayaking. 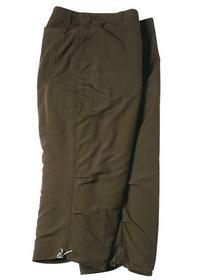 The White Sierra Womens Simpson Capris are light capris made with the same wicking material as other hiking pants. The capris come down to about mid calf when I am standing. They have elastic bungee around the bottom cuff to tighten it off. The knee is articulated for ease of mobility. The capris have belt loops with a non elastic waist, two side pockets, two back pockets and the back right pocket has a security pocket inside that can be zipped closed. The capris sit below the waist for a lower fit around the hips and have a button closure with zip fly. I received the size 10 in the faded denim colour. The colour is pleasing and the fit relaxed. The capris came with an orange sticker showing the capris are UPS 30 for sun protection. My initial impressions of the capris are that they have a nice generous cut that gives them a relaxed fit on me. I actually find them to be a bit looser around the waist then I would like but not so loose that I need a belt to hold them up. I received the women's size 10 after some fit issues. According to the chart, or maybe I am reading it wrong, my 30 in. (76 cm) waist and 40 in. (101 cm) hips should have been a little snug on the 10 but should have fit the size 12, but the 12 was way too big for me. The size 10 fits better although I still feel it is a bit loose. I was a bit surprised at how long the legs were as I was expecting the leg length to fall just below my knees. Due to the relaxed fit, I found that they didn't seem to bind up when I moved around. The front button looks like it is well sewn on. The button is actually quite large and is a snug fit through the button hole. This has made it a little more difficult to get the button in and out of the hole, but at least I feel safe in the fact that the button will not work its way out on its own. The cuff bottoms have a set of grommets that a bungee cord passes through. The bungee has a toggle in order to allow tightening of the cuff bottoms. I am not sure if this will serve a useful function, but I will experiment with it to see. The cut of the carpis is generous enough that I am able to hitch the capris up over my knees and put on my knee braces. The capris can then be tugged back into place and cover the braces nicely and with no binding. This is useful as putting knee braces on over pants is not pleasant. My test plan over the next couple of months will be to use the capris on all my outdoor activities. This will include backpacking, day hiking trips in the George Washington National Forest and the Shenandoah National Park as well as occasionally kayaking on the Potomac River. I will be interested in looking into how well the capris stand up to sitting and sliding over rocks, washing, and how they wear. As the weather warms up, I will look into how well they perform in hot weather versus the slightly cooler weather we are getting now. I will look into how fast they dry and if I have a chance to do a rain hike, how they wear when wet. I will also look into how well they protect me from the suns rays. I have taken the Simpson capris on one overnight trip and one day hiking trip for a total of 4 days of wear. The big overnight trip I took this on was a three day two night trip up into the George Washington National Forest in Virginia. The elevation gain was at most 3000 ft (914 m) and we camped at about 2000 ft (609 m). I wore the capris as my only form of pants for this whole trip. Around camp when the temperatures would drop at night, I paired the capris with a pair of rain pants for extra warmth, which worked very well. The capris worked well during the trip as I wore them to summit a bald peak and didn't have to put any sunblock on my legs. Except for my exposed ankles, it also seemed to keep the bugs away. Temperatures were in the high 80's F (about 30 C) during the day and at night they would drop to about 50 F (10 C). The day was a relatively easy 2.5 mi (4 km) hike in to a waterfall with very little elevation gain but many stream crossings. The water was about knee deep and I found the water temperatures to be very cold. The capris stayed dry on the more shallow crossings but eventually the crossing were deep enough that the bottom cuffs of the legs got wet. The eyelets would let water into the hem during the crossing, most of the water would drain out once I left the water. The legs dried fairly quickly, in about 10-15 minutes, just in time for the next crossing. I also took these capris on a business trip as my sole pair of relaxing pants for the times I was not working. As the temperatures ranges were quite variable, I found these worked out much better than shorts and pants in the same situation. The mornings would start off cool at about 45-50 F (7-10 C) then warm up to 75-80 F (24-27 C) before cooling off to about 60 F (16 C) in the evening. I really enjoyed wearing them off and on over the 5 days of the trip. The capris fit very nicely. I find them a little loose around the waist but not so uncomfortably that I need a belt. The legs are also a loose relaxed fit that makes climbing over rocks easy to do without having to hitch up the legs. The seat fits nicely and I didn't find it binding up when I would bend over or sit down. I don't normally store things in my pockets when I hike as I am afraid I will lose the items. As the capris sit low on the hips, the pockets sit lower too. As such, I find the pockets just a little inconvenient to use. I haven't used the back pocket at all yet and will have to explore the pockets further during the next phase of this report series. The capris have a drawcord around the cuff. I don't see any obvious use for this and tried to use the draw cord to keep the capris legs above my knees while doing the stream crossing. While the draw cord does keep the cuffs above my knees, the material above the drawcord simply bags over the cuff and hangs down over my knees. I guess it might keep bugs from crawling up my legs. So far, I have not noticed any signs of wear and tear on the capris except between the legs. There is a little pilling due to friction but it is not serious. I will continue to monitor the wear in that area to see if this will continue to wear more. They have taken several trips through the washer and dryer and still look like new. There does not seem to be any shrinkage on the capris either. Overall I like the relaxed fit of the Simpson capris. The loose, relaxed fit has so far worked well in a hiking and backpacking environment. I also find them stylish enough to wear around for everyday wear. And the lightness of the material, combined with the relaxed fit helps me to feel cooler. While it is not a complaint about the capris, I do wonder about the usefulness of the drawcord. I also find the pockets are set low but that is because the capris sit low on my hips and I accept that as part of the nature of the capris. Pros so far are the relaxed fit and quick dry material. Other than wondering abut the usefulness of the hem drawcord, I have no cons so far. I have taken these capris out on two more trips totaling 5 days and 3 nights. The first trip was a three day, two night backpacking trip out to the Canaan Valley into the Dolly Sods in West Virginia. Temperatures were in the 75-85 F (24-29 C) range and it was sunny each day. Except for when it cooled at night or in the morning, I wore the capris alone. Otherwise, I wore rain pants for extra warmth. The next trip out was an overnight 10 mile trip in the Shenandoah National Park. The elevation drop was 2000 ft (610 m) and temperatures were around 82-86 F (28-30 C). There were a few stream crossings but the stream was quite shallow and had lots of rocks, making it more of a rock hopping crossing then a get-your-feet-wet crossing. The capris kept up with me and worked well as I descended down the 2000 ft (610 m) drop over the first day. I did find I sometimes had to hitch the capris up. I find the fit at the waist to be a bit too big and felt that the capris kept slipping down. The waist of the capris falls almost exactly level with the bottom of my hip belt. As such, the hip belt helps hold up the capris in the back but in the front they capris tend to ride lower and bag open. The wear and durability of the capris has been very good. The fabric shows little signs of wear in the knees and bum area but does show some pilling in the crotch and inner thigh area from rubbing. I have washed the capris numerous times and have tossed them in the dryer too. The capris have shown no signs of shrinking or stretching from washing. I have gotten the capris hem wet over the course of stream crossings and the material dried quickly and didn't stretch out either. I do find that for capris, the inseam seemed a little long. I felt they would have been better if they had been a little shorter. I expected the hem to fall a little below the knees, but they were halfway between my knees and ankles. The capris are comfortable to wear but I felt I didn't get a good fit. Initially, the size chart didn't accurately match my measurements with the correct size, and when I dropped to a lower size it still wasn't a great fit. Had I been trying these on in a store I might have gotten a better fit. The size 12 I originally received was much too big and the 10 is also a little too big. I find that makes for a large sizing discrepancy for online ordering. Some of the sizing issues might be due to the lower waist line. The features of the capris that I liked most was the lower waist. 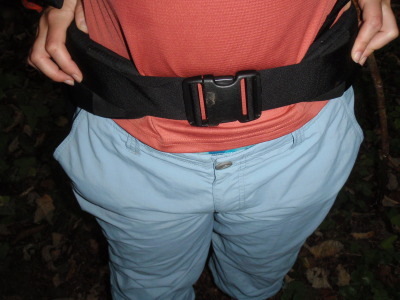 Although it did create fit issues, I liked that the waist was lower and didn't pinch under my hipbelt when hiking. As the waist line of the capris was close to the hipbelt line, I could hitch up the capris and tuck them under the waist band, or pull them down a little for a looser fit. I never found the back pocket helpful on backpacking trips as the bottom of the backpack prevents easy access to the pocket contents. I liked the idea of the zipper secured pocket but didn't use it while backpacking. The side pockets were more handy for little items and were always accessible due to the dropped waist line of the capris. The hipbelt never interfered with side pocket entry. This concludes my long term report on the White Sierra Simpson Capris. I hope you have enjoyed following this test series.